It’s Kentucky Derby week in Louisville, Ky., which means we’re hearing a lot about mint juleps. Contents aside, what makes this drink stand out is the distinctive cup in which it is traditionally served. Wakefield-Searce Galleries in Shelbyville, Ky., has a long history of making julep cups. 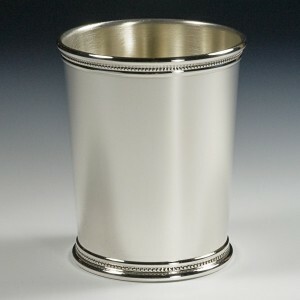 Since the Franklin Roosevelt administration, Wakefield-Searce has sent a silver julep cup to each U.S. president, hand engraved with the Presidential Seal on the side and the president’s initials on the bottom. Read the rest of the julep cup history here.